If you’ve ever been to any of the larger local conventions, like Gen Con or Indy PopCon, then no doubt you’ve seen them. Their booth has a Tardis as the cornerstone, and a huge banner with all of the Doctors on it. They are chock full of Doctor Who goodness, from Sonic Screwdrivers to Jelly Babies, from toys to scarves of incredible length. 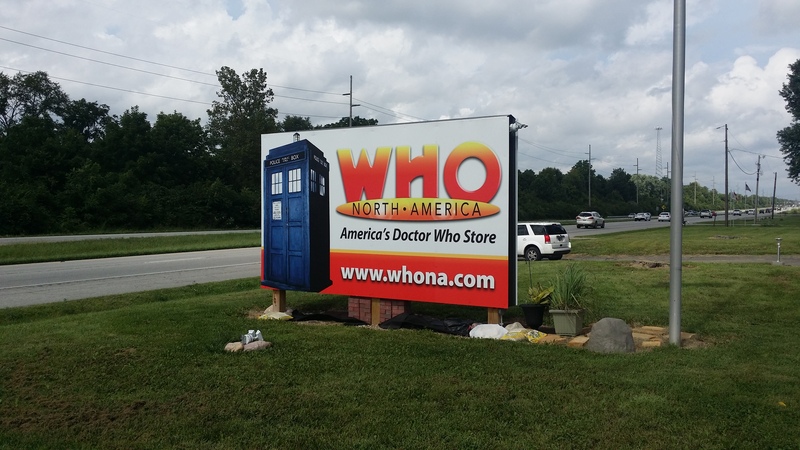 They are known on the web as WhoNA, which is short for “Who North America,” and they are one of the largest online retailers of Doctor Who and BBC merchandise in the United States. While WhoNA has a website full of awesomeness, nothing beats holding the items in your hands, or having the opportunity to see if that trench coat really fits. 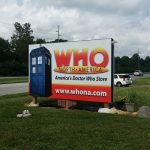 Lucky for us, WhoNA not only has a physical presence in Indiana, but they have a new storefront located in Camby, just southwest of Indianapolis! WhoNA’s new storefront is just fantastic. No longer located in an industrial complex, they feel more like a retail outlet than a warehouse. The museum is no longer crammed into a side room, it’s now right inside the door to the right. It’s spread out, it’s open, and it’s only in phase one! The arcade games are in a small side room, and they still have both the Doctor Who Pinball and the Star Trek Voyager Arcade Game. Plus, the retail section, the actual product they are selling, is now in a well-lit environment that feels very much like a store, with mirrors so you can see how the Capaldi jackets fit, and racks for the clothes as opposed to bins. Not only do they have the space to show off their collections and their stock, WhoNA also has space they are working on for gaming sessions, meetings, and classes. As of the publishing date on this post (9/2/2016), their event calendar includes beta tests of a Doctor Who board game, Doctor Who Pictionary, making sleeping mats for the homeless, a book club, and more. I know “… and Sewing is Half the Battle” will be doing costume/cosplay workshops there in the coming months, and we have discussed holding future Awkward Twitter Mingles there, too. What is their parking situation? They have their own property, which includes a small lot. Some special events might require off-site parking, with a shuttle service. When are they open? They are open on Tuesday, Wednesday, and Thursday from 11:00 AM to 6:00 PM, Friday and Saturday from 11:00 AM to 8:00 PM, and are closed on Sunday and Monday. Just kidding on the phone number! Internet! Where are they online? You can find the store’s site here, you can find their Facebook page here, you can find their Twitter feed here, and you can download their Android App here! First, thank you for taking the time to read, and comment, on my blog! Unfortunately, I’m just a resource for information, and I do not actually work for Who North America. If you are looking for a Tom Baker hat replica, I know I saw some in there when I visited a few weeks ago, so you might want to reach out to them using one of their web links, or at the phone number provided above. In addition, I’m going ahead and not approving the comment for the blog, because I don’t want your name and phone number just put out there, into the wild, opening you up to telemarketers, prank callers, and other horrible people. I hope you understand! Thanks, and have a fantastic day!